Free Shipping Included! Gigibon Professional On-Camera Shotgun Microphone, External Stereo Mic for DSLR Canon, Nikon, No Battery ( ME-1 Microphone Replacement) by Gigibon at EISF. MPN: MP-28. Hurry! Limited time offer. Offer valid only while supplies last. High-definition videos are a hot topic these days, thanks to a new generation of digital SLRs and advanced compact cameras that record HD videos. High-definition videos are a hot topic these days, thanks to a new generation of digital SLRs and advanced compact cameras that record HD videos. More and more still photographers and photojournalists are redefining themselves as multimedia professionals, recording moving images in addition to stills. But what about the sound? Does the quality of the audio that you're capturing do those stunning videos justice? The secret is the microphone you are using. Gigibon MP-28 on-camera stereo microphone is designed for digital SLR camera with 3.5mm Mic jack. This compact camera microphone records crystal-clear sound and significantly reduces autofocus noise on your DSLR camera. 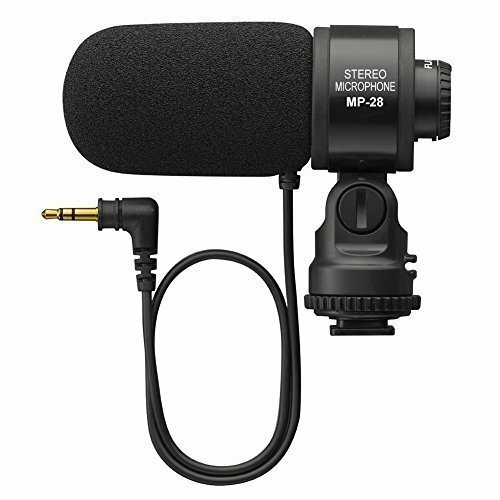 This recording microphone is compatible with most digital SLR camera featuring a 3.5 mm (diameter) stereo mini-pin jack. So if your Canon/Nikon has an outlet, then the MP-28 will work. Noted: Not for Sony camera. If you have any questions about this product by Gigibon, contact us by completing and submitting the form below. If you are looking for a specif part number, please include it with your message.